The Apollo 13 accident crippled the spacecraft, taking out the two main oxygen tanks in the Service Module. While the lack of oxygen caused a lack of power from the fuel cells in the Command Module, having enough oxygen to breathe in the lander rescue craft really wasn’t an issue for the crew. But having too much carbon dioxide (CO2) quickly did become a problem. The Lunar Module, which was being used as a lifeboat for the crew, had lithium hydroxide canisters to remove the CO2 for two men for two days, but on board were three men trying to survive in the LM lifeboat for four days. After a day and a half in the LM, CO2 levels began to threaten the astronauts’ lives, ringing alarms. 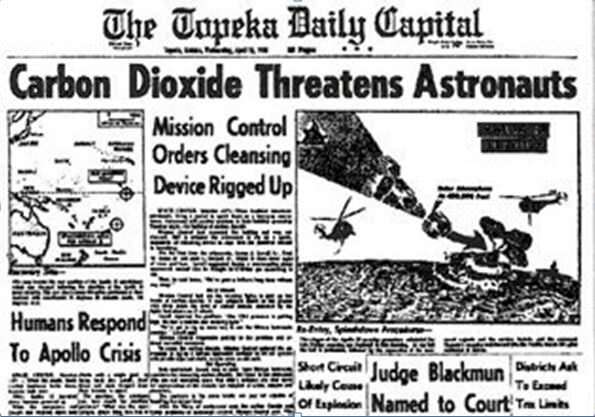 The CO2 came from the astronauts’ own exhalations. NASA engineer Jerry Woodfill helped design and monitor the Apollo caution and warning systems. One of the systems which the lander’s warning system monitored was environmental control. Like carbon monoxide, carbon dioxide can be a ‘silent killer’ – it can’t be detected by the human senses, and it can overcome a person quickly. Early on in their work in assessing the warning system for the environmental control system, Woodfill and his co-workers realized the importance of a CO2 sensor. The sensor’s job was simply to convert the content of carbon dioxide into an electrical voltage, a signal transmitted to all, both the ground controllers, and the cabin gauge. Location of Caution And Warning System lights in the Command Module. Credit: Project Apollo – NASSP. And soon after the explosion of Apollo 13’s oxygen tank, the assessment of life-support systems determined the system for removing carbon dioxide (CO2) in the lunar module was not doing so. Systems in both the Command and Lunar Modules used canisters filled with lithium hydroxide to absorb CO2. Unfortunately the plentiful canisters in the crippled Command Module could not be used in the LM, which had been designed for two men for two days, but on board were three men trying to survive in the LM lifeboat for four days: the CM had square canisters while the LM had round ones. Needless to say, the story had a happy ending. The Apollo 13 accident review board reported that Mission Control gave the crew further instructions for attaching additional cartridges when needed, and the carbon dioxide partial pressure remained below 2mm Hg for the remainder of the Earth-return trip. But the story of Jerry Woodfill and the CO2 sensor can also serve as an inspiration to anyone who feels disappointed in their career, especially in STEM (science, technology, engineering and math) fields, feeling that perhaps what you are doing doesn’t really matter. NASA engineer Jerry Woodfill with Chris Kraft, former NASA flight director and manager, in early 2015. Image courtesy Jerry Woodfill. But after some changes in management and workforce, Woodfill became the lead Command Module Caution and Warning Project Engineer, as well as the Lunar Lander Caution and Warning lead – a job he thought no one else really wanted. But he took on the job with gusto. And so, just hours after the explosion on Apollo 13, the Mission Engineering Manager summoned Woodfill to his office. Now, what Woodfill had once had deemed trivial was altogether essential for saving the lives of an Apollo 13 astronaut crew. Yes, instrumentation was just as important as any advanced system aboard the command ship or the lunar lander. This is an example of the team effort that saved Apollo 13: that the person who was working on the transducer years prior was just as significant as the person who came up with the ingenious duct tape solution. And it was one of the additional things that saved Apollo 13. “Things had gone real well up to at that point of 55 hours, 54 minutes and 53 seconds (mission elapsed time),” said Apollo 13 astronaut Fred Haise as he recounted the evening of April 13, 1970, the night the Apollo 13’s command module’s oxygen tank exploded, crippling the spacecraft and endangering the three astronauts on board. What followed was a four-day ordeal as Haise, Jim Lovell and Jack Swigert struggled to get back to Earth, as thousands of people back on Earth worked around the clock to ensure the astronauts’ safe return. Jerry Woodfill and Fred Haise at the 40th anniversary celebration of Apollo 13 at JSC. Image courtesy Jerry Woodfill. Haise described the moment of the explosion during an event in 2010 at the Smithsonian Air and Space Museum commemorating the 40th anniversary of the mission that’s been called a successful failure. In 2010, Universe Today also commemorated the Apollo 13 anniversary with a series of articles titled “13 Things That Saved Apollo 13.” We looked at 13 different items and events that helped turn the failure into success, overcoming the odds to get the crew back home. We interviewed NASA engineer Jerry Woodfill, who helped design the alarm and warning light system for the Apollo program, which Haise described above. Now, five years later on the 45th anniversary of Apollo 13, Woodfill returns with “13 MORE Things That Saved Apollo 13.” Over the next few weeks, we’ll look at 13 additional things that helped bring the crew home safely. Woodfill has worked for NASA for almost 50 years as an engineer, and is one of 27 people still remaining at Johnson Space Center who were also there for the Apollo program. In the early days of Apollo, Woodfill was the project engineer for the spacecraft switches, gauges, and display and control panels, including the command ship’s warning system. On that night in April 1970 when the oxygen tank in Apollo 13’s command module exploded, 27-year-old Woodfill sat at his console in the Mission Evaluation Room (MER) at Johnson Space Center, monitoring the caution and warning system. Located in an auxiliary building, the MER housed the engineers who were experts in the spacecrafts’ systems. Should an inexplicable glitch occur, the MER team could be consulted. And when alarms starting ringing, the MER team WAS consulted. Woodfill has written a webpage detailing the difference between the MER and Misson Control (Mission Operations Control Room, or MOCR). The Mission Evaluation Room. Credit: Jerry Woodfill. The ebullient and endearing Woodfill brings a wealth of knowledge — as well as his love for public outreach for NASA — to everything he does. But also, for the past 45 years he has studied the Apollo 13 mission in intricate detail, examining all the various facets of the rescue by going through flight transcripts, debriefs, and other documents, plus he’s talked to many other people who worked during the mission. Fascinated by the turn of events and individuals involved who turned failure into success, Woodfill has come up with 13 MORE things that saved Apollo 13, in addition to the original 13 he shared with us in 2010. Woodfill tends to downplay both his role in Apollo 13 and the significance of the MER. But Apollo Flight Director Gene Kranz, also speaking at the 2010 event at the Smithsonian Air and Space Museum, has never forgotten the important role the MER team played. Apollo 13 astronauts Fred Haise, Jim Lovell and Jack Swigert after they splashed down safely. Credit: NASA. And it wasn’t just the astronauts who were grateful. As a testament to the appreciation the rest of the country felt, the Mission Operations Team for Apollo 13 — those who worked in the Mission Operation Control Room (MOCR – more commonly called Mission Control) and the Mission Evaluation Room (MER) — were awarded a Presidential Medal of Freedom. The Presidential Medal of Freedom awarded to the Mission Operations Team of Apollo 13. Image courtesy Jerry Woodfill. In previous articles in this series, we’ve highlighted just a few people who made significant – and some unsung – contributions to the Apollo 13 rescue. But likely every person who was part of the mission operations team made a contribution. Certificate given to Woodfill for the Congressional Medal of Freedom. Image courtesy Jerry Woodfill. But, says Woodfill, it wasn’t just those whose names are listed on the initial award. Employees at Johnson Space Center witnessing the President presenting the Presidential Medal of Freedom to the Apollo 13 Mission Operations Team (April 1970). Image courtesy Jerry Woodfill. But since Apollo 13 happened 40 years ago, many of those involved are no longer alive. Woodfill said astronaut Jack Swigert is an example. A 40th anniversary celebration of the Apollo 13 mission at Johnson Space Center in April included a panel discussion with Jim Lovell, Fred Haise, Gene Kranz, Glenn Lunney, John Aaron, and was moderated by Jeffrey Kluger, co-author with Lovell of the book Lost Moon. Read Woodfill’s account of the celebration on his website. 40th anniversary celebration of Apollo 13 at Johnson Space Center. Image courtesy Jerry Woodfill. So, while we have only scratched the surface among the many stories of Apollo 13’s rescue, surely there are thousands more tales of people being in the right place at the right time, decisions made years earlier that led to working at NASA, and chance meetings or discussions that opened up opportunities or jogged ideas for the rescue. Jerry Woodfill is an example of such a story. He was attending Rice University on a basketball scholarship, a dream that inexplicably came true. Inspired by Kennedy’s speech, Woodfill turned in his basketball shoes and focused on his studies of electrical engineering, hoping to become part of the space program to send people to the Moon – and return them safely to the Earth. Yes, Woodfill become one of the half million Americans teaming up together to put the first men on the Moon.